Happy Birthday Tim! 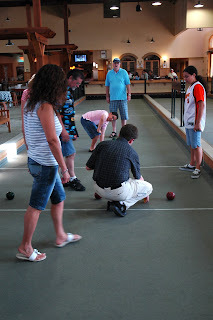 We celebrated Saturday by playing Bocce Ball in Livermore. It was 99 degrees outside so I was thrilled that the court was inside. There were a lot of people there and I was surprised at how many young people played the game. We ate dinner and then headed back to the house for some poker, Wii, and dessert. 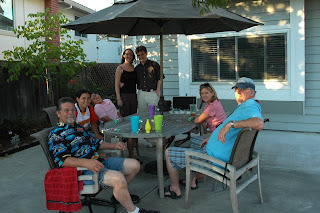 Vicky took this photo of us outside in the backyard after it cooled down. 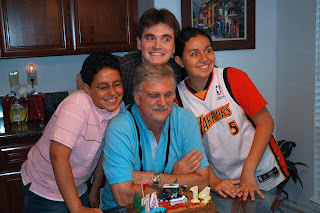 We didn't have the number 6 for Tim's cake. Dan thought it would be great to put 74-14 on the cake. Tim thought that was great! Went to dinner last night at a cute restaurant in Woodside with a bunch of friends. I ordered tacos and got more than I bargained for. It was enough to feed 3 people! I watched a lot of movies this past week. I love that Indiana Jones and the Last Crucade was corny and entertaining. I just love Sean Connery's character. 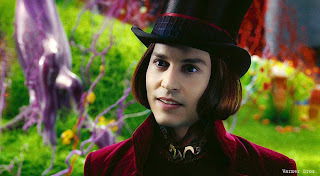 I have become an even bigger fan of Tim Burton and his work after having seen Charlie and the Chocolate Factory. Incredible art direction and acting, as usual! Jenna rented Fool's Gold and told me it wasn't good and not to watch it. I adore Matthew MacConaughey & Kate Hudson, so I did anyway, knowing that it wasn't that good. I enjoyed the beautiful scenery of Australia and the silly humor. I also saw Premonition. It was ok but probably won't watch it again. Leo introduced me to a funny British tv show called Extras. It was so funny I watched the entire season in one sitting (only 6 episodes). I can't wait to see Season 2. They have the funniest cameos in each episode. I thought I had already seen the movie Fool's Rush In, but when I started it the other night I realized that I had not! I adore Matthew Perry and Salma Hayek in this cute story! And finally, I just finished watching The Bucket List and it was absolutely wonderful. By far the best movie I watched this week. Go out and rent it if you haven't seen it. I want to make a bucket list myself but I need to complete my list of 23 things before I turn 24 first. I'm going through my digital photos and deleting some (26,000 is a bit much). I've already deleted 2,000 today. Back to editing. Bocce ball is so fun! I just added the bucket list to my netflix list. Just watched The Jane Austen book club...which I really liked. looks like youve been having fun! I really want to see fools gold too, even though i hear its not that good, hehe. Seems like you have been having a blast lately! So many movies this time. What are you looking forward to next? I cannot believe you hadn't seen Fools Rush In. Definitely a cute movie. Oh, movie fun! =) And I *heart* Tim Burton...and I was kinda iffy about the Bucket List..but I wanna see it now! lol...also, bocce rocks, doesn't it? We went to a 'tournament' last year and had never played, and there tons of young people! he he...hope all is well! I saw all those movies (not this past week lol) but by far Bucketlist was really a nice surprise of a good sentimental movie for sure. Fools Good wasn't a blockbuster but it wasn't so bad either, but I heart Kate Husdon movies. i love, love, love johnny depp and all of his fantastic characters he plays. i could watch charlie and the chocolate factory over and over...even if the girls aren't watching it with me! Ha ha! Too funny that you watched Indiana Jones and The Last Crusade because that's what the hubs is sitting here watching while I am playing on the computer. We saw Definitely, Maybe this week. Seen it? I thought it was a really cute movie. I totally want to see The Bucket List, so I'm glad to hear that you liked it!